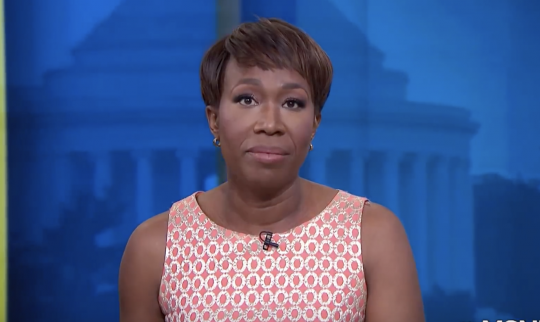 MSNBC host Joy Reid issued an apology on Friday as pressure mounted on her and the network to address inflammatory blog posts she made beginning in 2005. Reid appeared to drop her previous claims of being hacked, saying she was "sincerely apologizing again" for her posts and that she was "embarrassed" by some of the things she wrote. Among the newly reported posts on the now-defunct The Reid Report include photoshopping Sen. John McCain's (R., Ariz.) head on the 2007 Virginia Tech shooter, spreading 9/11 conspiracy theories and saying former Iranian President Mahmoud Ahmadinejad was "onto something" with the suggestion of relocating Israelis to Europe. The posts were written before Reid came to national prominence at MSNBC. "While I published my blog, starting in 2005, I wrote thousands of posts in real time on the issues of the day," Reid said in a statement to the Washington Free Beacon. "There are things I deeply regret and am embarrassed by, things I would have said differently and issues where my position has changed. Today I’m sincerely apologizing again. I’m sorry for the collateral damage and pain this is causing individuals and communities caught in the crossfire." In a separate statement, MSNBC said Reid's past blogs were "not reflective" of her as a colleague. Reid is a popular progressive voice and strident critic of the Trump administration on her weekend show, "AM Joy." "Some of the things written by Joy on her old blog are obviously hateful and hurtful," MSNBC said. "They are not reflective of the colleague and friend we have known at MSNBC for the past seven years. Joy has apologized publicly and privately and said she has grown and evolved in the many years since, and we know this to be true." In her new statement, Reid also specifically addressed McCain. "To be clear, I have the highest respect for Sen. McCain as a public servant and patriot and wish him and his family the best," Reid said. "I have reached out to Meghan McCain and will continue to do so. She is a former on-air colleague and I feel deeply for her and her family." She also said she had no doubt about al Qaeda's responsibility for the 9/11 terrorist attacks or Israel's right to its sovereignty. "I’ve also spoken openly about my evolution on many issues and know that I’m a better person today than I was over a decade ago. I am the daughter of immigrants and have worked to be a strong ally of these communities," she said. "There is no question in my mind that Al Qaeda perpetrated the 9/11 attacks or about Israel’s right to its sovereignty." "I believe the totality of my work attests to my ideals and I continue to grow every day," she concluded. Reid initially took responsibility in December when a Twitter user uncovered some past homophobic blog posts on The Reid Report. However, she took a different route when Mediaite reported in April on other past blog posts expressing discomfort with homosexuality and opposition to gay marriage. Reid said they were "fabricated" by an hacker who had manipulated her site. However, media outlets found no evidence to substantiate her claims, and Reid later admitted she could not prove it. Nevertheless, on the April 28 episode of "AM Joy," she still did not take responsibility, saying, "I genuinely do not believe I wrote those hateful things because they are completely alien to me. But I can definitely understand, based on things I have said and have written in the past, that some people don't believe me." Reid's new statement also did not address the alleged FBI investigation into her hacking claim. Her lawyer said they had "confirmed" such an investigation was taking place; by custom, the FBI does not comment on whether or not it's conducting investigations. UPDATE: 2:29 P.M.: This article was updated to show Reid's statement didn't address the alleged federal probe into her hacking claims. This entry was posted in Politics and tagged John McCain, Joy Reid, MSNBC. Bookmark the permalink.